On Friday afternoons at John Lyon all pupils put their Academic timetables to one side and participate in the School’s broad, engaging and fascinating Co-Curricular Programme. The Co-Curricular Programme offers something different to pupils beyond the classroom and is aimed at developing a sense of achievement, wellbeing and enjoyment, while gaining practical skills and engaging with the eight School Values. 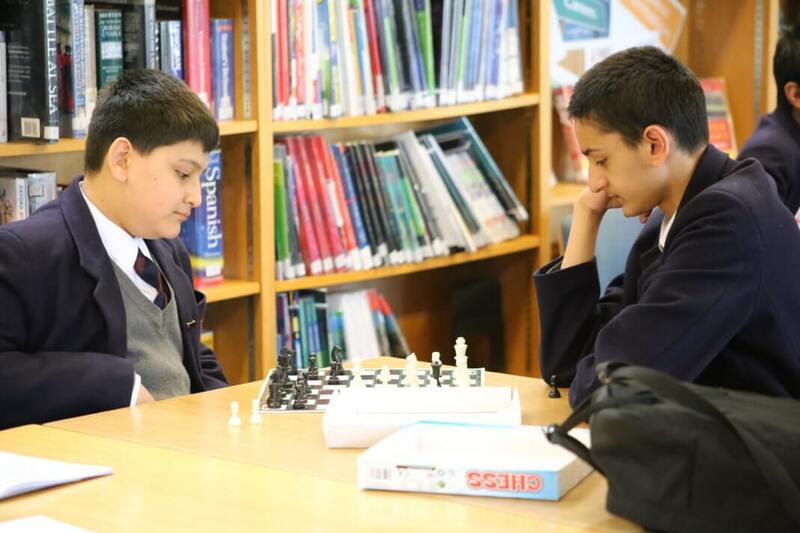 During the Autumn and Spring Terms, boys in Years 7 and 8 engage in a bespoke carousel of activities before undertaking a larger project in Summer Term. 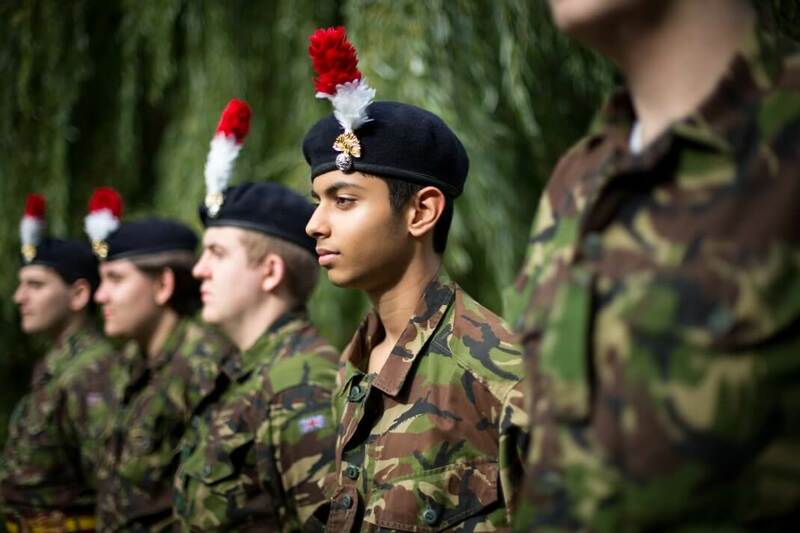 For boys in Years 9 to Upper Sixth, there is an hour of mandatory activities in Autumn and Spring Terms, followed by an hour of an activity of their choice selected from a large list of options. The Summer Term focuses on wider projects and preparation for exams and university for the older students. A ‘rounded’ education given a firm emphasis, with a timetabled programme of ‘skills-based’ activities including everything from cooking to changing a tyre. Plenty of trips and societies, from computing to chess. ‘It’s a very broad ranging education,’ commented one contented father. Spring 9, 10, 11 American sport is both competition and culture. In this course you will explore the rules, tactics and teams that play the three major American sports, Basketball, American Football and Ice Hockey, and look into the history of the sports to see how they affect the USA as a nation. Hands-on experience will come in the form of touch Football and Basketball. L6, U6 Animation has come a long way from simple flip-books and is now box office. In this course you will make a short animation that can tell a story, sell a product or promote a point of view. You will then create a paper-based storyboard to be translated into an animation using Adobe Animate. Motivated will come from seeing winning entries from the Schools’ National Animation Competition and we hope you will be encouraged to enter the competition yourself. John Lyon has had two winning entries in the past. L6, U6 Need to get something done or a quick answer? There’s an app for that. In this course you will learn how to create apps for mobile devices with use of programming blocks in App Inventor. You will be given the opportunity to create your very own app which can be run on an Android phone, tablet or emulator installed and run on computer screen. L6, U6 Ever wondered what else is out there? On this course you will learn more about our position in the Universe, the movements of planets and stars, the cycles in the night and daytime sky, and the ways in which we use technology to observe and interact with space. You will follow an incredible story of how scientists, from ancient civilisations to the modern day, have used their imagination and carefully recorded visual measurement to explore the Universe in which we live. L6, U6 Have you ever wanted to expand your mind and think well outside the box? In this course you can explore some of the greatest minds in human history by looking at some of the key themes from great philosophical works – from Plato’s Ancient Greece to the political writings of modern American philosophers. L6, U6 They may be tiny but bees are vital for the success of our world. In this fascinating activity you will learn more about the natural world and play an important role in helping our struggling pollinators to survive. You will learn all aspects of beekeeping and gain a greater understanding of the life-cycle of a hive. This activity will also involve creating a space that is bee-friendly to ensure the success of the School’s apiary. Big Ideas Spring 11, L6, U6 Will we ever leave the planet to live amongst the stars? Will our inventions enslave humanity? Can we develop an equation for happiness? These are just some of the questions tackled here. 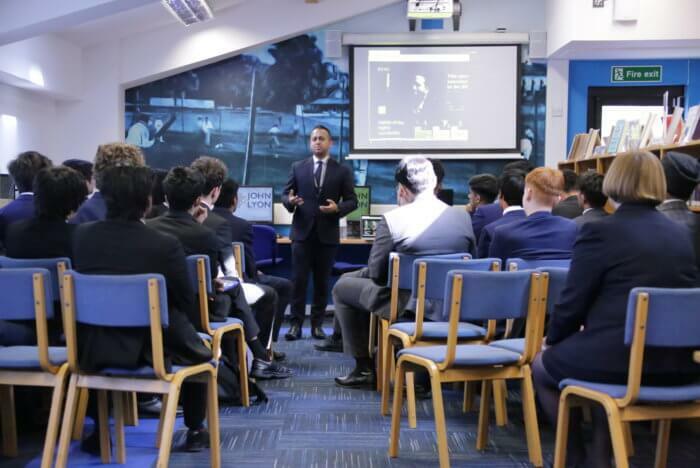 Each week you will focus on thought provoking and stimulating topics, with lectures ranging from emerging digital technologies such as AI and crypto-currencies, through to philosophical matters such as racism, hate and greed. After watching each lecture there will be opportunity to debate the content and explore the implications. L6, U6 Can you conjure up an obscure word in Scrabble? Or hold your nerve as the Jenga tower starts to lean? 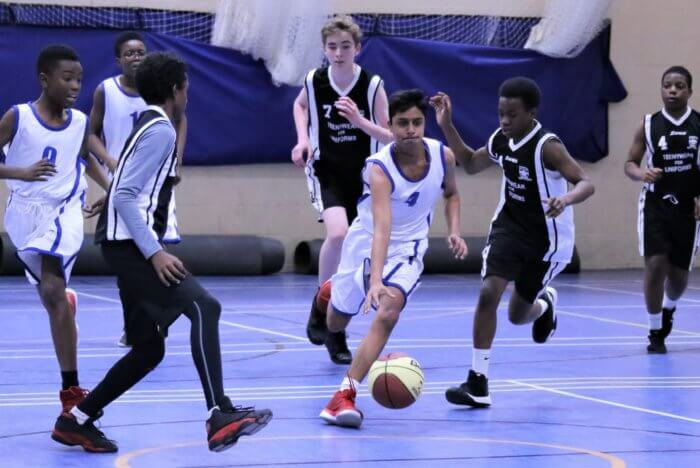 In this activity you will get to play a wide variety of games – old and new – all designed to develop your transferable skills and to test strategy, knowledge and competitive instinct. Business Short Course Autumn 9, 10 Think you’re the next Richard Branson? If you have an idea for a genius product, or a solution to an irritating daily problem you can take part in the Business Dragon’s Den Challenge. Creativity and teamwork skills will be put to the test to create a brand new product before pitching it to a panel of experts. The best business plan will be crowned the winner with some great prizes up for grabs. L6, U6 Calligraphy is an impressive skill which can be used in many different areas of life. Here you will learn how to create decorative handwriting and write in a new style with calligraphy pens. This is a useful skill to have and could help with the study of art and design. It also helps enormously with improving handwriting. 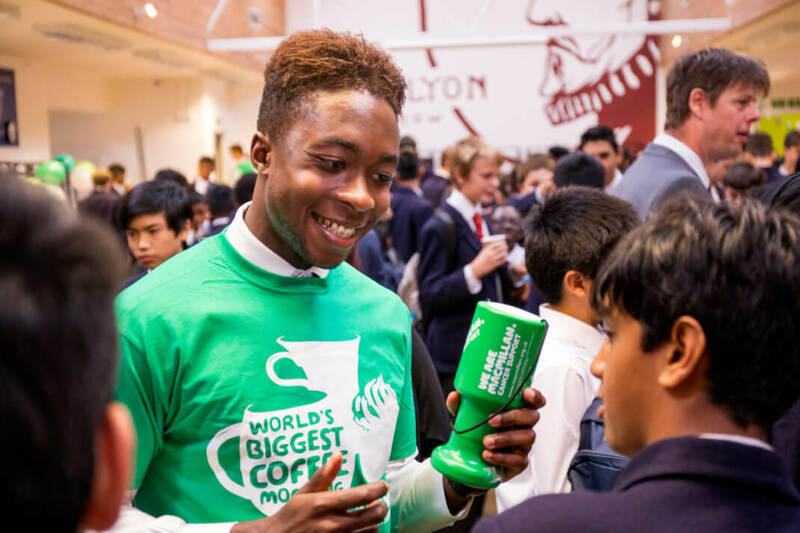 L6, U6 “A man’s true wealth is the good he does in this world.” As part of the Charity team, you will help organise and put on charity events in school, aiming to beat the previous year’s fundraising total of £14,000. L6, U6 Ever thought of yourself as a strategic genius? Chess will encourage and develop your problem-solving skills. In this course, alongside playing the game, you will learn one move or strategy each week and have the opportunity to challenge boys from different year groups in this most technical of board games. L6, U6 Conserving the natural world is a huge challenge. In this course you will learn about the dangers the natural world faces, as well as what can be done to mitigate the damage humanity is causing. Numerous projects will be undertaken which will aim to reduce our negative impact on the environment, raise awareness and also raise funds for conservation efforts around the world. This is practical course and will include creating wildlife habitats such as bird boxes, bat boxes, bird feeders and a wildlife pond, as well as some beekeeping and elements of gardening. L6, U6 Do you have a novel or short story in you that you wish to express? Have you ever thought that you would like to share your ideas with others? This course focuses on writing effective fiction that is also lively and engaging. You will learn about the key elements of fiction including structure, characterisation, dialogue, different styles of writing and how to develop a story to make it interesting. You will also be shown how to think about and edit your writing. Cross Country Running Autumn 9, 10, 11 Cross country running is a fantastic way to build strength and fitness, whilst enjoying the great outdoors. It will help you become a great all-round runner and also give you the tools to excel further at other sports. This course includes a variety of routes, giving the opportunity to run on different terrains, and is a great chance to really challenge yourself. L6, U6 Do you like crosswords and word puzzles? If so you can expand your brain, apply logic, increase your vocabulary and gain more general knowledge by learning how to approach crosswords, from simple to advanced. You will also explore the fascinating world of cryptic crosswords. Other word puzzles will also feature, including some used in the intelligence world to recruit spies and code-breakers. L6, U6 Do you like to get your point across? Or perhaps relish an occasional impassioned conversation? Debating is an intellectual sport and in this course you will be introduced to a limitless range of ideas and motions and be challenged to defend a certain position – a skill needed in higher education and the workplace. 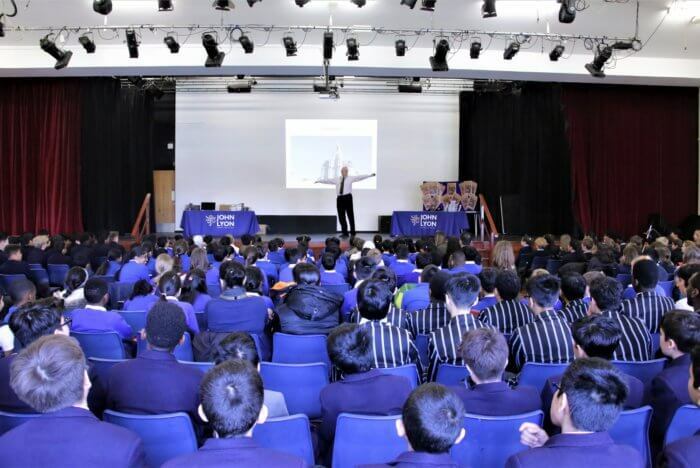 Debating teams of all ages get the opportunity to compete in both internal and external competitions. L6, U6 Do you like to know about the hottest new apps and keeping up with online trends. This course will help lead internet safety at John Lyon and you will design assemblies, tutor times and year group sessions which will promote online safety. You will also help boys use technology and the internet positively, so that all pupils can develop good digital footprints and profiles that will attract potential universities and employers. Spring L6, U6 To create a stunning dramatic performance a lot goes on behind the scenes. In this course you will help created and deliver a series of bespoke workshops culminating in a performance that draws together pupils from a range of local schools.  You will gain experience working with primary school children, teaching, acting and directing a performance in an ambitious project that will culminate in a large scale production. A great opportunity to gain valuable project skills and to contribute to the lives of local children. L6, U6 Would you like to be part of an exciting, new, fundamental initiative in the school? You will be part of the important drive to reduce the John Lyon’s carbon footprint, water use, use of resources and waste, while improving recycling efforts and environmental awareness. You will engage in your environment by actively protecting it, becoming a conscientious consumer and learning how to make eco-friendly choices every day. Spring 9, 10 If you like knowing exactly how everything works, this course will be a fun activity as you learn the basics of how electronic circuits work. You will have the chance to use a soldering iron and circuit boards to build your own gadgets. L6, U6 Are you the next Spielberg? This course is a great opportunity to immerse yourself in the world of film making by exploring different methods of filming as well as editing your footage. You will look closely at the world of Hollywood and create your own ‘Sweded’ versions of film trailers. This enjoyable course will give you a creative insight into how and why film is created. Spring L6 The Gold Crest Award is the pinnacle of STEM in schools. If you are selected to begin the Award, you will be in a team expected to put in 70 hours of work towards a project decided on and designed by you. 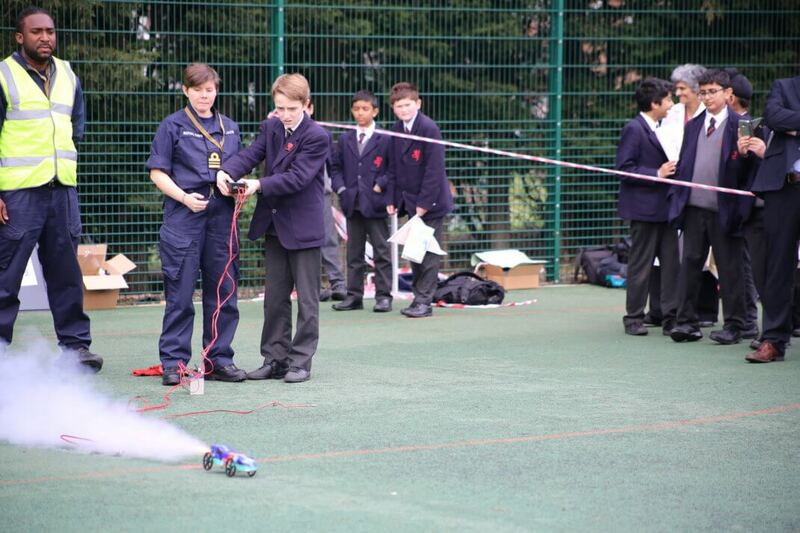 Teamwork, project management and STEM related tasks would be at the forefront of learning through this experience. Historical Film Review Spring 11, L6, U6 The twentieth century saw the rise of film around the world. This course will give you the opportunity to watch and discuss a range of historical films with a focus upon the accuracy and the background to the periods shown. By the end of the course you will have a far wider appreciation for some interesting periods in History ranging from Idi Amin’s Uganda to the battlefields of the Second World War. Language Option: Brazilian Portuguese Autumn 9, 10, 11 Portuguese is a language that is linked to both French and Spanish. This course will help you improve your knowledge of both these languages and give you a solid grounding in the basics of the Portuguese language; conversations, introductions and simple vocabulary that will be extremely useful if you decide to visit either Portugal or Brazil. You will also learn about Brazilian culture and get to try some of the famous dishes from Brazil. Language Option: German Spring 9, 10, 11 German is the most widely-spoken language in Europe and heavily used in tourism, business, science, art and engineering. In this course you will learn some conversational basics to start, and explore one of our most important European neighbours along the way. Language Option: Russian Spring 9, 10, 11 Did you know that Russian is one of the most widely spoken languages in the world, and that being able to speak it is regarded as a highly impressive skill? This introductory course will give you the tools to tackle the Russian alphabet (the Cyrillic alphabet) and the ability to read sentences that most people would be flummoxed by. You will learn the basics of how to introduce yourself and how to ask questions in Russian, and on top of this there will be a cultural section that will allow you to discover more about the country that brought you this year’s Football World Cup. Spring 11, L6, U6 If you like swimming, learning new skills and want an internationally recognised qualification at the end, Lifesaving Skills is for you. You will work towards the National Pool Lifeguard Qualification learning key skills such as swimming pool supervision, intervention, rescue, emergency action plans, CPR, AED and first aid. The course comprises physical training and theoretical classroom work, followed by a practical in-water and out-of-water assessment. L6, U6 An exciting new project for 2018-19 will see John Lyon become the North West London hub school for the London Chamber Orchestra’s Music Junction project. If you are a musician you can get involved with this project and help mentor pupils from local primary schools, allowing them to discover a range of instruments and musical styles. Spring 9, 10 Micro:bit is a tiny programmable computer which will help you learn all about coding. In this course you will use the popular BBC Micro:bits and electronic resources to design, build and program some simple robotic devices. L6, U6 International politics make the headlines every day. Model United Nations offers you the opportunity to engage in debates about some of these geopolitical issues. 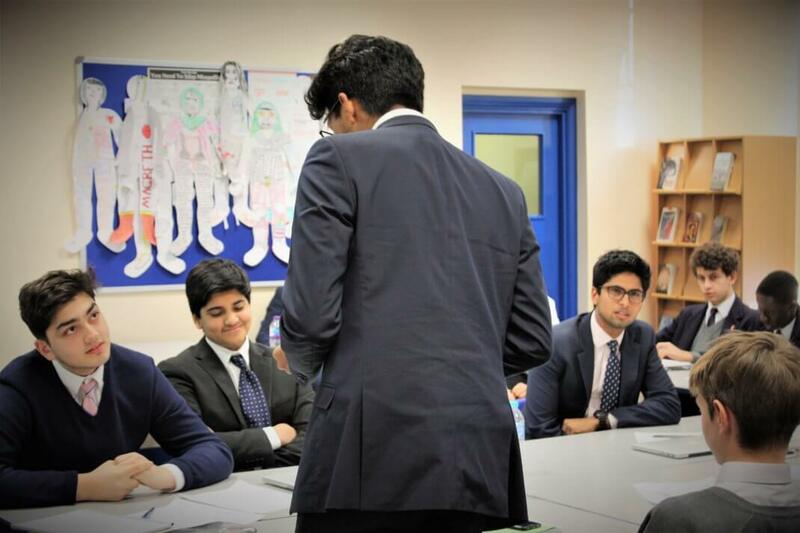 You will take part in committee debates, taking on the role of the UN Security Council, the Health Committee, the Environment Committee or Political Committees debating UN resolutions. The activity will sharpen your debating skills and offer up the chance to take part in external MUN events. L6, U6 If you are a budding young Beethoven or John Williams this course is your chance to be coached in the technical aspects of composition – either in the classical or popular style. The best compositions will be performed at a School concert and be recorded. L6, U6 Good films are primarily about ideas rather than action sequences or special effects. The Matrix and The Truman Show explore Cartesian ideas about ‘brains in vats’; 12 Angry Men explores the public use of reason; Fahrenheit 451 shows us a world where thinking critically is discouraged by authority. This activity will involve watching some good films together and then discussing what they are really about. L6, U6 “A picture is worth a thousand words”. This course is a chance to learn more than ‘point and shoot’ photography and will explore both the creative and technical sides of photography. You can participate with an SLR camera or even just a smart phone. Topics covered will include composition and framing, camera controls, exposure, aperture, shutter speed and picture editing. Come along and improve your approach to picture taking. L6, U6 The benefits of a healthy body are endless. In this course you will be introduced to the principles of eating well and will track personal progress over the term, link this to the School’s Healthy Lifestyle Programme. Along with this, the basics of Pilates will be taught, helping you improve core strength and flexibility. Spring L6, U6 Art can really bring people together and in this course you will have the opportunity to work with pupils from a local primary school to create stunning artworks. You will explore ideas before researching, planning and executing the project. You will look at a variety of sculptors’ work to create a three-dimensional piece for each student. You will work as a mentor and have responsibility for a small group of younger pupils, allowing them to learn from your creative expertise. Spring L6, U6 If your favourite part of Science classes are the experiments, this practical activity will allow you to work with junior school children as they begin their own scientific journeys and learn to use science equipment in a fun and safe environment. Spring L6, U6 All the maths you have learned in the classroom will become fun activities as local junior school children come to John Lyon to learn more about numbers. You will help guide the younger pupils to the correct answers, acting as mentors as they improve their maths skills. L6, U6 Are you a budding journalist, photographer, vlogger or blogger? The School blog will be a space for you to express your writing and creativity by creating regular and engaging content on subjects that interest you, while all the time growing an audience to consume it. Science Society Autumn 9, 10, U6 How does a glow stick work? How can this information be used to solve crimes? This course will aim to investigate the many practical applications of a study of chemistry and the difference that can be made on a global stage. 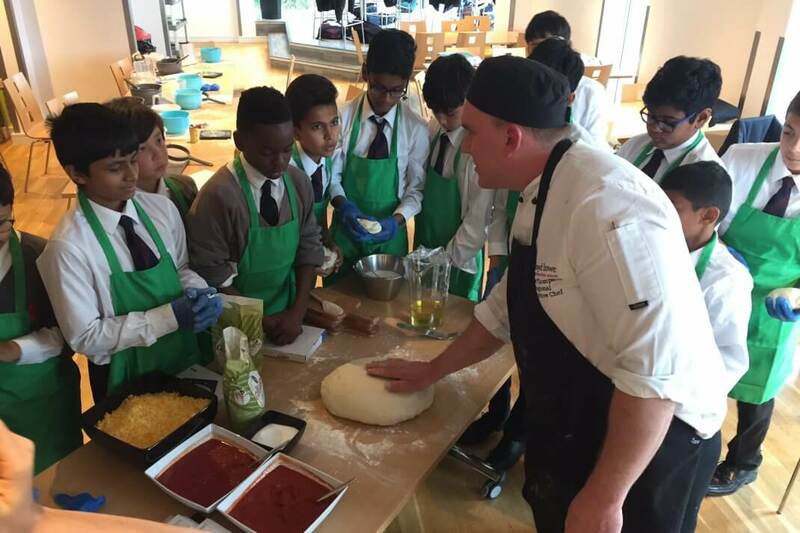 From forensics to the food industry, you will see how the various theories and principles you have learnt in science lessons relate to real world scenarios. Topics will include forensics, engineering, pharmaceuticals, nanotechnology, the food industry, renewable energy, and materials science. Shakespeare Schools Festival: Macbeth Autumn 9, 10, 11 Designed for the cast of the Shakespeare Schools Festival: Macbeth, this session will see two pupils direct a cast of 25 to produce a unique 30 minute adaptation of Macbeth. This will be performed in a professional theatre in London in November. 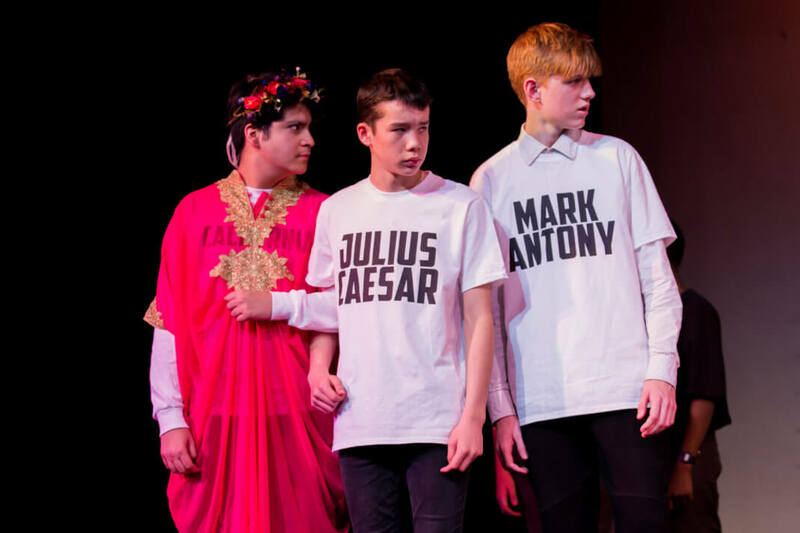 This is part of the wider Shakespeare Schools Festival which sees 30,000 young people from primary, secondary and special schools across the country unite in the world’s largest youth drama festival. Spring 10, 11, L6 Sport and sporting progress would go nowhere without leadership. This course is an exciting opportunity to build knowledge and experience within the sports industry. It will give you an insight into a number of leadership positions within sport, looking at the roles of coaches, referees/umpires, performance analysts, sports journalists and event organisers. L6, U6 STEAM disciplines continue to grow at John Lyon, with a range of activities focusing on the creative combination of Sciences, Technology, Engineering, Art and Maths to solve real life problems. This course will provide an opportunity to invent, design and refine a product that will make a difference in the world. L6, U6 If you have rhythm and concentration tap dancing may be for you. Aimed at beginners, this tap dancing course will help increase focus and creativity in a fun and expressive way. You do not need to have danced before, just be a good listener and confident to give something new a try. It is not essential to have your own tap shoes either, as flat soled shoes will also be acceptable. L6, U6 Virtual reality is booming. In this course you will investigate the use of VR headsets and the range of software available with them. You will complete a project to show how VR could potentially be used in an area of school life.